Award-winning entrepreneur; Soccer visionary and Super Bowl ad creator who has been featured in Forbes, Inc. and Fast Company; See why companies like S&P Global have benefited from Qiana's talks. 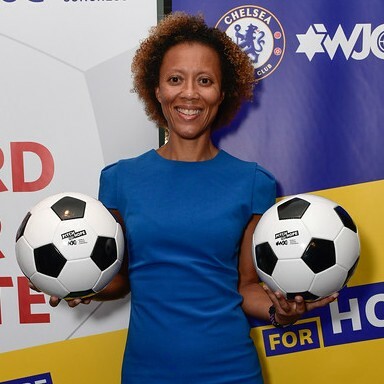 An Award-winning entrepreneur; soccer visionary and Super Bowl ad creator, Qiana Martin’s journey of defying expectations has transported her from playing street soccer with guys in parks to traveling the world participating in the sport and helping global brands connect with soccer fans. Her unique expertise, innovative approaches and diverse cultural experiences have garnered features with Forbes, Inc, Fast Company, Men’s Health, Huffington Post, Our World with Black Enterprise and U.S. News & World Report. Drawing from her exceptional record for landing game changing opportunities, Qiana’s inspired storytelling provides audiences with a fresh perspective on tackling diversity challenges, a mindset to maneuver everchanging business environments and the motivation to achieve championship level wins for their companies. The British Airways Face of Opportunity Award recipient and former Fila model crafts her presentations to align with the strategies of your event. Working with your planning team to come up with novel ways that she can go the extra mile, Qiana strives to make sure her presence at your event is a memorable one for both attendees and sponsors. See why companies like S&P Global have benefited from her presentations. Find out more about Qiana Martin at https://eatsoccer.wixsite.com/qianaspeaks.